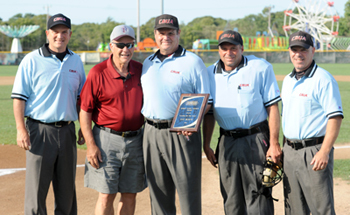 This summer, he reached the pinnacle in his profession by receiving the ninth annual Curly Clement Award, presented for officiating excellence and contributions over the years to umpiring in the Cape League. Burns, who hails from Pittsburgh, moved to Mansfield, Mass., in 1984 to manage a harness racetrack called Foxboro Raceway, now the site of Gillette Stadium. He is a 1983 graduate of Harry Wendelstedt’s School for Umpires and began his career in the Pittsburgh area and the Short “A” Pioneer League in Montana, Idaho, and Alberta, Canada. Burns was the recipient of the 1995 Boston Park League Dan Roberts Memorial Umpire Award and has officiated baseball games in NCAA Division I, II & III and NJCAA, Cranberry League, Boston Park League, Stan Musial Tournament, 1995 Junior World Olympics and high school. He is also a member of the International Association Approved Basketball Officials Board 27 for the Greater Boston area. He graduated from Central Catholic High School in Pittsburgh and Indiana University of Pennsylvania in 1981 and received his master’s degree in 1982. He worked for 20 years in the UMass-Boston athletics department, and 20 years through 2008 as senior athletic director for Business Operations. Burns has worked for Foxboro Raceway and Yonkers Raceway, Twins Enterprises Inc. – the Yawkey Way Store across from Fenway Park – as well as for the New England Patriots and the Mansfield High athletics department. Previous Clement Award winners include Joe Caraco (2012), Mark Ottavianelli (2011), Michael Sadowski (2010), John Leeds (2009), Harry Greer (2008), Tim Carey (2007), Peter Hall (2006), the late Jim McNally (2005) and Walter Bentson (2004). "Pat is an imposing figure on the baseball diamond and nobody doubts who’s in control,” said CCBL Senior Deputy Commissioner Sol Yas, who helped present the award to Burns during pre-game ceremonies Thursday night at Guv Fuller Field in Falmouth. Clement worked as a Cape League umpire for more than four decades and was inducted into the Cape League Hall of Fame in 2002. He umpired in 16 NCAA Division I Baseball Regionals, several Eastern College Athletic Conference Division I Baseball Championships and two NCAA College World Series during his career. Affectionately known as the “Candy Man” thanks to his propensity for passing out candy to players, coaches and field managers during on-field disputes, Clement’s final Cape League appearance was working home plate at the 2000 CCBL All-Star game. He died in 2006 after a long illness.